acchedyah — unbreakable; ayam — this soul; adahyah — unable to be burned; ayam — this soul; akledyah — insoluble; asosyah — not able to be dried; eva — certainly; ca — and; nityah — everlasting; sarva-gatah — all — pervading; sthanuh — unchangeable; acalah — immovable; ayam — this soul; sanatanah — eternally the same. 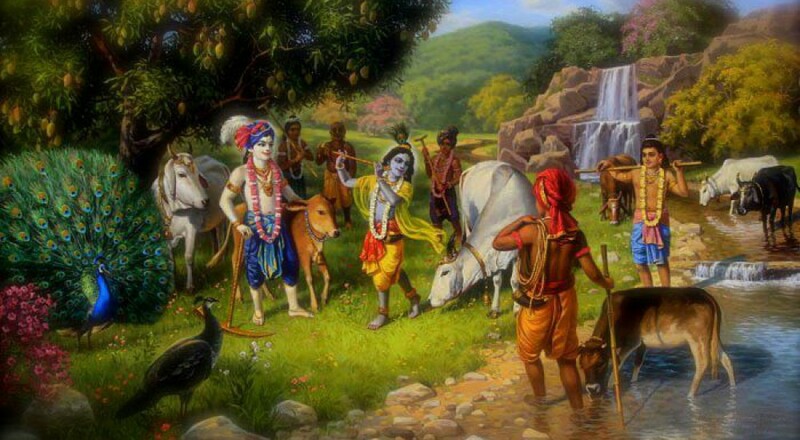 sarva-bhuta-stham — situated in all beings; atmanam — the Supersoul; sarva — all; bhutani — entities; ca — also; atmani — in the self; iksate — does see; yoga-yukta-atma — one who is dovetailed in Krsna consciousness; sarvatra — everywhere; sama-darsanah — seeing equally. na — never; ca — also; mat — sthani — situated in Me; bhutani — all creation; pasya — just see; me — My; yogam aisvaram — inconceivable mystic power; bhuta-bhrt — the maintainer of all living entities; na — never; ca — also; bhuta — sthah — in the cosmic manifestation; mama — My; atma — Self; bhuta-bhavanah — the source of all manifestations.